Forged from chrome vanadium steel hardened, tempered and satin chrome plated for corrosion protection. 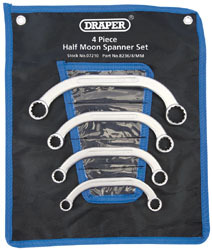 Draper HI-TORQ® ring ends. Designed for working in confined spaces. Supplied in wallet. Sold loose.